Nation of Islam leader Louis Farrakhan claims to be Jesus here to complete mission 'to end the civilization of the Jews' in video. Nation of Islam leader Louis Farrakhan claimed to be Jesus and that he would fulfill Jesus' mission of destroying the Jewish civilization in a newly revealed video. Speaking at a 'Savior's Day event in February, Farrakhan said that "God does not love this world. God never sent Jesus to die for this world. Jesus died because he was 2,000 years too soon to bring about the end of the civilization of the Jews. He never was on a cross, there was no Calvary for that Jesus." "The real story is what I tried to tell you from the beginning. It didn’t happen back there. It’s happening right while you’re alive looking at it," Farrakhan continued. "I represent the Messiah. I represent the Jesus and I am that Jesus. If I am not, take my life." The Nation of Islam leader further claimed that he made deaf hear and dumb speak. "When I made the call in 1995 to Black people, with the Million Man March, that was like Jesus calling Lazarus and Lazarus came forth." "Some of you do today reject because the white man told you I’m an evil man, I’m a hater, I’m an anti-Semite. I hate Jewish people, I hate gay people. Here I am in front of you. I represent the Jesus that saves. I don’t represent somebody that came to judge you and me for our errors and mistakes…Everywhere I went I found myself rejected. My black people, they accepted me. But now white people are frightening the hell out of black people. College presidents are punished for allowing me or anyone that represents me to come on the college campus because they fear what’s in my mouth from my teacher the Honorable Elijah Muhammad. 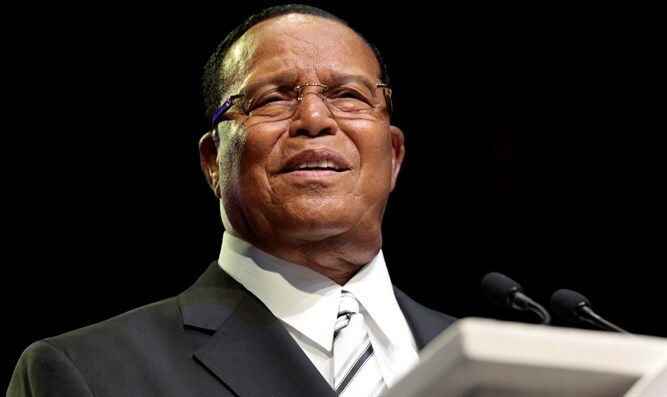 Farrakhan also praised freshmen Congresswomen Ilan Omar and Alexandria Ocasio Cortez, saying that Omar had "nothing to apologize for" after she drew controversy with a series of anti-Semitic comments. Farrakhan has a long history of anti-Semitic statements. In 1984 he praised Nazi leader Adolf Hitler and derided Judaism as a gutter religion. In the intervening 35 years, Farrakhan has since accused American Jews of being part of the “Synagogue of Satan”, compared Jews to termites, warned of the eventual annihilation of whites, claimed that white people were artificially created by a mad scientist and calling them only “potential humans”, accused “the Jews” of helping Adolf Hitler “get the Third Reich on the road” and last year led a chant of “Death to Israel, Death to America” during a visit to Tehran.